You’re happily quilling along when … BAM! You look closely and notice the biggest, most eye-catching, glaring mistake that has ever been made in the history of quilling paper. It’s probably not that bad. I know it seems like the worst thing that could happen, but give yourself some grace! Chances are most viewers wouldn’t even notice, but if you’re a perfectionist like I am, you want a fix and you want it fast! 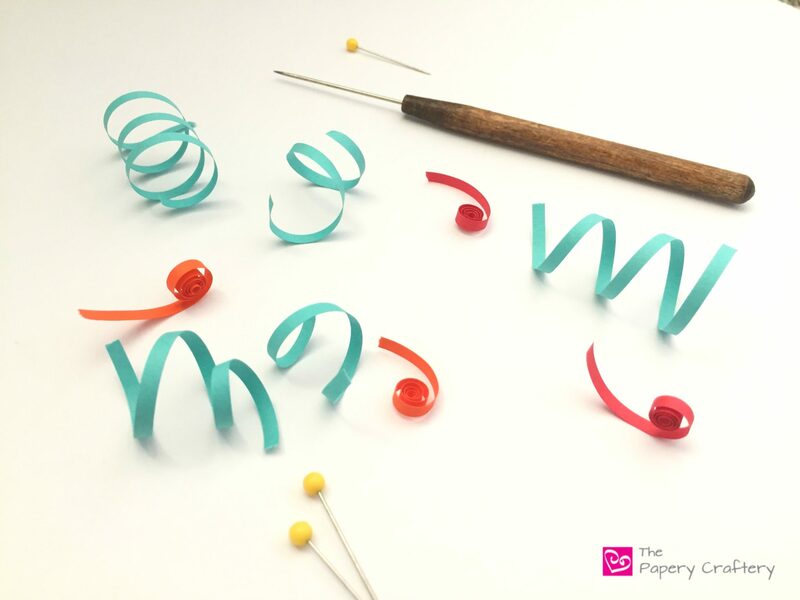 This week, let’s cover 7 common quilling mistakes and how to fix them. Excess glue can really make a mess of your quilling. A great rule is “less is definitely more”. It’s just paper, after all. It weighs next to nothing, so not much more than a small dot of glue is really needed. But, if you find yourself having a hard time controlling the amount of glue you use, try using a needle-nosed bottle to apply it. I use mine on every project and it’s a life-saver. Another great tip is to keep a thin paintbrush handy to wipe away any extra glue before it dries. My personal experience is that most unwanted dried glue is from gluey fingers. It can be really helpful to keep a moist towel around to wipe your fingers clean every once in a while. As for the glue that’s already on the outside of your coils ~ I’ve had some success with scraping gently with a needle tool. It took me a little while of quilling before I realized the way to prevent uneven coils and shapes. When you’re ready to shape your coils, hold the center with one hand while pinching with the other. This keeps the center of the coil where it belongs instead of moving to one side or the other. If you want to make consistently equal coils, think about using a quilling template workboard to keep them from moving too much as they expand. The reason that the background of quilling work gets wrinkly is that the paper being used is too thin to hold up to the glue needed for attaching your work. I’m a huge fan of using thick mat board for mounting my quillings. Another tip ~ use very little glue. Try tiny dots instead of covering the entire piece before mounting. If you’re looking for a more decorative backing, try adhering patterned scrapbook paper to mat board first using spray adhesive or matte Mod Podge. The color and pattern possibilities are endless! There is nothing worse than thinking you’re completely finished with a project, then realizing it is sitting a little crooked on its backing. Is it just a tiny fraction off? Try trimming the background slightly. If the finished piece is going to be framed, it will not be noticeable. Another option is to try to remount the quilling. Using a craft knife, cut around the entire piece including the backing and remount. It may sit much higher, because of the additional backing. But that may be preferable to a lopsided quilling. Next time you’re ready to mount a finished work, try using a ruler below the quilling to make sure it’s centered. I’ve also used multiple rulers to get everything juuuuuust right! It can be difficult to make sure that all your pieces are perfectly level as they dry on your work board. Sometimes you may not notice that a section has popped up until it’s too late! This is a situation that happens to me pretty often, and my solution is to use a craft knife. I gently (very gently!) move the blade between the two shapes that are giving me trouble. They break apart and I just have to reglue. I wouldn’t recommend this solution for the faint of heart, however. There is a good chance that the coils accidentally be cut or misshapen. The best practice is to use a straight edge or a finger before the pieces dry to check for evenness and avoid this problem altogether. I mentioned in the post last week on making quilling paper mittens that I like to make double-thick quilling strips to use on edging work. While the most important step in making these strips is applying steady glue all the way through, there will be times when there’s a gap. And that gap in glue will lead to a buckled spot in your strip. It’s usually something you wouldn’t notice until you’re using the strip on a project. And by then, you’re not going to want to pull the whole piece out, right? I’ve found a great solution is to use those tiny scissors and snip the bubble. Add another tiny spot of glue to the remaining ends, and use your tweezers or a pin to hold tight until it dries. I’d love to learn some new secret tricks! I’ve found for the tiny dried glue bits, it helps if you take a [barely-] damp sponge and dab at your construction very, very gently. It helps get rid of them. Thanks, April, that’s a new one for me. I wonder if it would be helpful to rip up a sponge into smaller pieces to hit those hard to reach spots. When I glue quills onto the card, I pick them up with tweezers and gently dip the bottom into the glue. Perfect! Thanks so much for sharing, Anon! When I first started quilling, a glue bottle with the steel tip came with the kit. Problem: it turned the Elmer’s Glue black when coming out. I see you recommend this type of bottle, and I assume you don’t have any problems with it. Is it a certain type that you use? Also, I use a light paperweight on my work after gluing several pieces on the mat. Helps keep them even. I know there are different manufacturers of the needle-nosed glue bottles, so it may just be a problem with the kind that came with your kit. The only time I’ve had a problem with the glue turning colors is when I lost the cap that came with the bottle. I tried to plug the needle with a straight pin while I wasn’t using it. The glue eventually rusted the pin and turned some of the glue a little brown. I’m guessing the same type of chemical reaction is happening with the bottle you’re using. I don’t know the brand I’m using now. I’ve bought them from quilling supply sites and Amazon without a problem. It’s true, Margaret. Tearing quilling paper is one of the first tips I always give to new quillers! I use the end of a sewing needle to apply glue. I’ve tried cocktail sticks (and a thin screwdriver in a moment of need!) but find thin applicators a lot easier to use. I quite often rub the glue over the join so it’s over both sides and therefore less likely to unstick. Great tips from everyone. I’ve made all of these mistakes in the past. I use ppa glue from Amazon. When dried its water proof. I’ve seen PPA around, but never tried it. I’ll have to give it a go sometime! I do not know if this is the proper place to ask a question but here goes. The handle of the 15 prong quilling comb has many horizontal paper guide channels and 3 vertical channels. Please explain what they are for and how to use. I’ve never seen a quilling comb with a handle like that before. The husking board I reviewed a few weeks ago had some slim channels on the bottom of it. Maybe take a look at that post and see if the photos and examples look similar to the tool you have. If not, hopefully another reader will see your question and be able to give us some advice! Have you tried putting glue on a plastic card and smooth it paper thin, that way when you dip your quill on it gets a very thin layer of glue all the way down the strip.